Welcome to Just Tyres Tonbridge. You won't be under any pressure to buy shock absorbers or brakes because we don't sell them! We only supply and fit car, 4x4 and van tyres. This means we offer you expert knowledge and a wide choice of tyre brands. Just Tyres Tonbridge provides a wide range of products at competitive prices, and we can refund the difference on any tyre purchased within a 20-mile radius of our Tonbridge fitting centre. You just need to bring us a written quote on the price within 7 days of the initial purchase, while online quotes are not accepted. Tonbridge tyre fitting centre is on Riverside Industrial Estate on Vale Road. 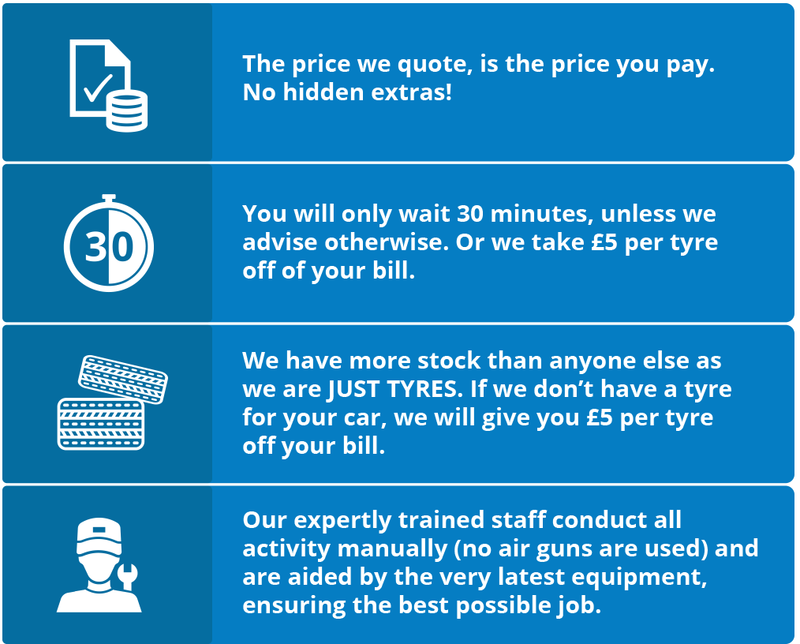 If you are looking to buy tyres in Tonbridge or the surrounding areas, we would be happy to help. Don't forget you can also pop in for a FREE Tyre Check where we can offer advice and assistance on any tyre queries you may have. If you would like to buy your tyres online and have them fitted at our tyre fitting centre in Tonbridge, just click on the Buy Online image and book your fitting day and time during checkout. The Tonbridge Just Tyres fitting centre is located on Vale Road roughly 500m away from Tonbridge Train Station. Our friendly team will be more than happy to assist and answer any queries you may have regarding your tyres or driving requirements. Just Tyres would be more than happy to assist whether you visit our fitting centre or buy online and have them fitted at our Tonbridge Fitting Centre.